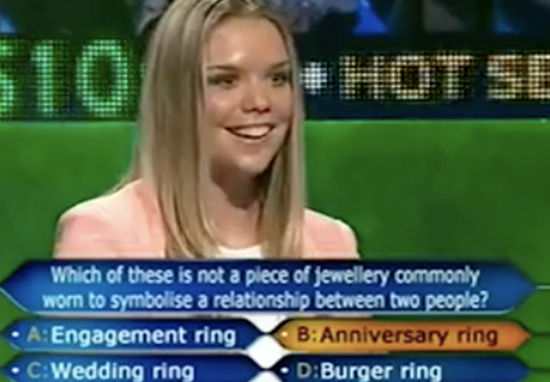 Who hasn’t daydreamed about how far they would go on Who Wants To Be A Millionaire, silently weighing up a mate as a potential ‘phone-a-friend’ during pub quizzes? 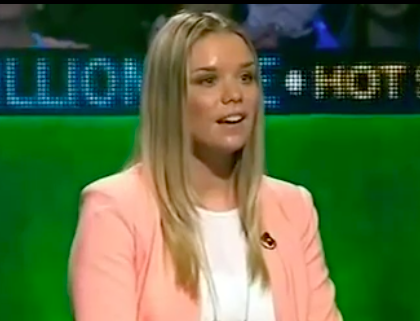 Even though Chris Tarrant last declared ‘but we don’t want to give you that!’ back in 2014, we all still feel there’s a Judith Keppel inside of us; ready to win top prize with our impressive Eleanor of Aquitaine knowledge. Now, the iconic show has been revived, with new host Jeremy Clarkson relishing giving his contestants a bit of a roasting. Now, we are all of us guilty of having the occasional mind blip. Cereal in the fridge. Calling your date by your pet’s name. But usually such face-palm moments don’t happen when there are huge amounts of money at stake. Which of these is not a piece of jewellery commonly worn to symbolise a relationship between two people? 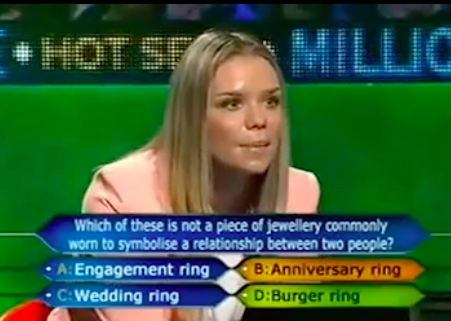 Oh Im going to go with B on that one Eddie, anniversary ring. Although Burger ring is an interesting one. Fair play to Eddie, he gave oblivious Whitney another crack at it; cautiously pushing her to ‘have another look’ before repeating the question. Still resolute in her baffling choice, Whitney ignored the gentle hint; cheerfully confirming her decision. 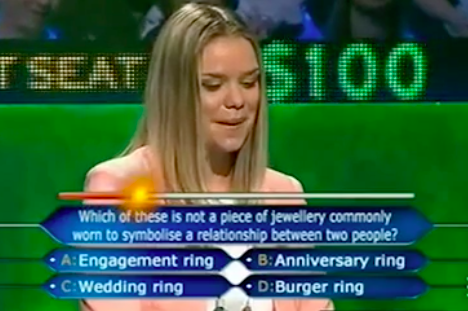 Nobody but Whitney was shocked when the real answer turned out to be Burger ring, which is a popular brand of Australian crisps. Oh crumbs. Oh Burger ring. Oh my God. Oh my God Eddie that’s the most embarrassing thing that’s ever happened to me. Can we cut and start again please? The only thing you got right was that bit when you said it’s the most embarrassing thing you’ve ever done in your life. Whitney tried to explain how her mistake was down to nerves, but Eddie stood firm. Sadly, rules are rules and she was removed from the hot seat like a burger from a grill.